Dr. James R. Davis, is a scholarly man of God. Dr. Davis’ studies and research give him a unique perspective on the Christian life. Dr. Davis’ ministry extends for over 37 years. While Dr. Davis’ credentials as a Christian scholar are widely known, he is approachable and friendly in every way. One of the marks of a Christian is friendli­ness. Dr. Davis exemplifies the Word of God in his everyday life. On most occasions, you will find Dr. Davis working to help improve the lives of the community and its citizens. Whether he is an advocate in board rooms or attending to the needs of impoverished persons, Dr. Davis’ ministry is fixated on following the laws of God. Dr. Davis is married to his lovely wife of 52 years, Lorraine, and they have two sons, two wonderful daughters-in-law, five grandchildren and one great-grandson. Dr. Davis was born in Rocky Mount, North Carolina and relocated with his parents to New York City in 1954. He served in the United States Army as a Medical Corpsman from 1965 – 1968, received his Bachelors degree in Sociology from Brooklyn College, New York, in 1975, received his Bachelors and Masters degrees in Theology respectively in 1987 and 1988, and the Doctor of Sacred Theology was conferred upon him in 1989 from the United Christian College of the United Holy Church of America in New York City. 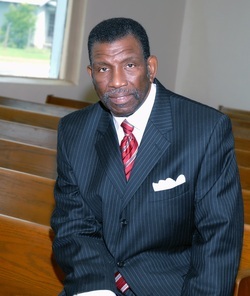 In 1992 and 1996 respectively, Dr. Davis organized the New Covenant Bible Institute, Inc., in New York City and Rocky Mount, North Carolina, which has been approved as of May 13, 2009, by the President of the University of North Carolina at Chapel Hill, N.C., to offer the degrees of Bachelors, Masters, and Doctor of Theology as well as the Bachelor of Religious Education degree. On May 19, 2009, New Covenant Bible Institute, Inc., was granted accreditation status by the American Accrediting Association of Theological Institutions, Inc. On December 10, 2012, the City Council unanimously appointed Dr. Davis to the Planning Board for the City of Rocky Mount, North Carolina.